Fig. 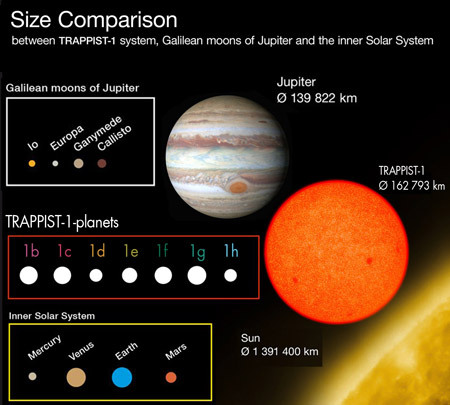 1: Size comparison of the TRAPPIST-1 planets with bodies from the solar system. All planets found around TRAPPIST-1 are nearly earth-sized. Source: ESO/O. Furtak. Fig. 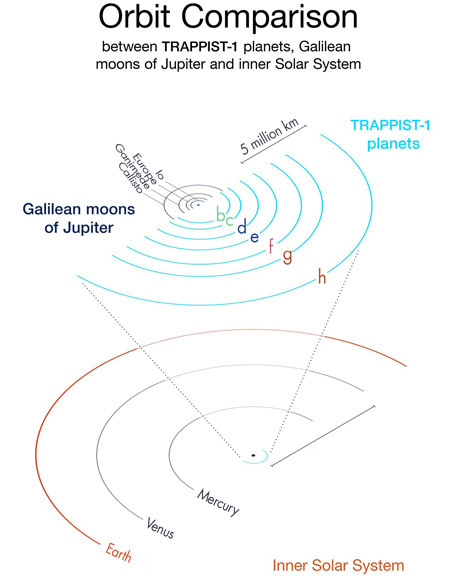 2: Comparison of the TRAPPIST-1 system with the inner solar system and the Galilean moons of Jupiter. All planets around TRAPPIST-1 are subject to similar radiation as Venus, Earth and Mars and even for the outermost planet TRAPPIST-1h, one year takes onlay approx. 20 days. Source: ESO/O. Furtak. Fig. 3 (left): Light curves of the seven TRAPPIST-1 planets during their transits. The graph shows how the light of the very small, ultra-cool and dim dwarf TRAPPIST-1 gets weaker while each of the seven known planets passes in front of the star and blocks some of the light. The larger planets cause larger dips in the light output, the planets that are further away have longer transit times, as they revolve at a slower pace. All this data comes from observations with the NASA Spitzer telescope. Fig. 4 (right): VLT observations of the light curve of TRAPPIST-1 during the triple transit of 11 December 2015. The star was observed with the HAWK-I instrument on the VLT of the ESO, as three planets passed in front of the star and blocked its light output. This light curve shows for the first time three temperate Earth-sized planets with moderate climates and two of them in the habitable zone which pass in front of their star. Source: ESO/M. Gillon et al.